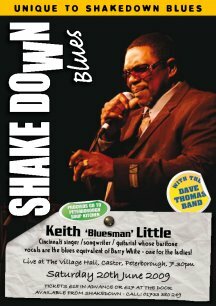 Keith �Bluesman� LittleKeith Little was born in Cincinnati, Ohio to Clarence and Dosier Little on July 15th 1953. His god-fearing parents moved whilst he was still a babe in arms to Georgiana, Alabama and it was here that he was raised with his brother Larry. His father Clarence was a gospel singer and formed a quartet The Golden Wings in 1957 whilst also singing in the Galilee Missionary Baptist Church Choir on Sundays and high days. The young Keith soaked up this tradition whilst hanging onto his father�s leg. His first encounter with the blues came when he was 7 years old and courtesy of an old blues guitar player called Willie (�I never did know his last name�) who lived three doors away. Keith was attracted to the �blue notes� and would sit on Willie�s porch for hours listening to the old man play. When Keith was in the sixth grade his mother bought him a guitar and his brother Larry a drum kit. Together, with their cousins, they settled down to practice gospel music. However, the radios in the neighbourhood were often tuned into music stations and soon the boys began to pick up on the latest B.B. King/Bobby Bland offerings. So when the adults were away the boys began to play �The Blues�. If they were caught they would be given extra bible studies to drag them back into the path of righteousness. Meanwhile not all of the adults disapproved and his uncle, the famous pianist Big Joe Duskin, was always there if they needed encouragement. In 1973 Keith went back to Cincinnati and formed a band called the �Electric Flag�, which featured the Farringdon Brothers singing whilst performing back flips and splits on stage. During this time he also began to hang out with older blues men on the local scene listening befriending and playing with the great Albert Washington, H Bomb Ferguson, Big Ed Thomson, Roosevelt Lee and Pigmeat Jarrett. At the same time he was inducted into the gospel quartet �The Original Christianaires� as a bass player and singer replacing Bootsy Collins who was moving to stardom in a different world. Six months later and hungry for success Keith left both these groups and formed his own R&B outfit �The Iceband� which played soul / funk / R&B and blues and his own gospel group The Goldenaires Gospel Quartet. He went out on the road with both groups looking for fame and fortune. Marriage and five children soon put pay to this idea and Keith began looking for a better paying job and sensibly decided to open his own construction business which paid the bills but restricted him to only playing locally and at weekends. During the next twenty years he also found time to become a play writer, produce a video documentary of the Cincinnati blues scene (Thanks for my Flowers) host a TV show (Mr Little�s Hangout) and become Vice President of the Cincinnati Blues Society. In 1995 he produced the excellent album of self-penned blues and R&B �The Cincinnati Blues Man� on San-Ton Records. Four years later he formed his own PAES Records and recorded a live album �Going Downtown� at The Jefferson Hall in Cincinnati and in 2001 he released the very fine �A Mothers Love�. Last year he sent me a copy of his latest CD �Take It Off And Get Loose With It�. His voice by now has mellowed into a smooth baritone and reminds me slightly of a blues version of Barry White. I was asked by the organisers of The Peterborough Festival if we could find a suitable act to open this years proceedings I immediately thought that Keith would be the perfect choice. Stone blues for the men, soulful knee tremblers for the ladies. Luckily Keith was available and Dave Thomas was happy to bring his band for what was another great party night in Castor.